Alternate Title: No Rest For You! After two poor weather days and coming up short on mileage, we knew we needed to really hike today and not fall further behind. Somehow for the third day in a row, rain clouds still hovered above. 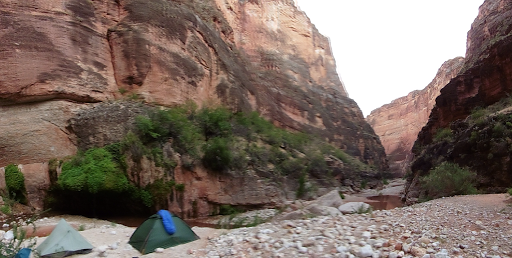 It rained for at least two hours overnight and we again did not have a very restful night. 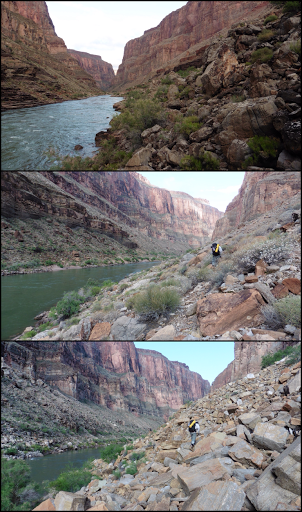 Gavin and I got going by 7am on the 4.4mi left of the boulder hopping along the Colorado. The brothers are on a more relaxed schedule and were leaving later, so we said our goodbyes and were off…it was slow going as expected. It was very tedious and slow going, but nothing nearly as bad as the bushwhack along the river by the Little Colorado last leg. This one varied with short stretches on the beach, in brush, on large rocks, and over/around big boulders. We were lucky that the clouds were out for much of it. As we hiked, many of the boats and rafts we saw camped yesterday floated by. We were again providing some good entertainment and waved as they passed. One supply boat came by and we waved. Someone yelled, “we cheated!” and when we looked closer, we notified it was Jerry and Norm, who we met yesterday! 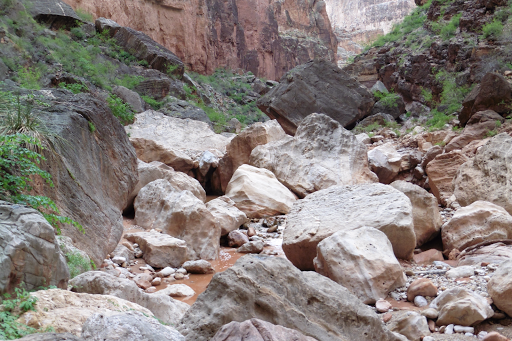 This was their fourth time attempting this boulder hop as part of a backpacking trip to connect Deer and Kanab Creeks. They hitched twice and one of them sprained an ankle another time. We couldn’t believe anyone would voluntarily do this once much less four attempts! It was classic to see the two of them chillin’ on that boat! Seriously, the best moment of the day since I never saw it coming and the timing was impeccable just as we were completing the boulders. The boat behind them even offered to take us the rest of the way. So tempting, but we resisted. I really think that non purists should just hitch these river traverses on the Hayduke. Sooo much more enjoyable! I’m going to have to do one of those raft trips someday. We finally finished the boulders after 4hrs, so it was pretty much a mile an hour. It wasn’t horrible, just tediously slow and stressful as you are super focused on each foot placement and using all your limbs to scramble with a pack on. Compounding it was that we’ve been out for a week and the last few days have been tough. On top of that, having had ankle surgery and knowing what it’s like to have an ankle randomly give out completely (it still does and is like jello at times), I am very stressed by boulders. We were both pretty spent after those four hours straight through just to get it over with. 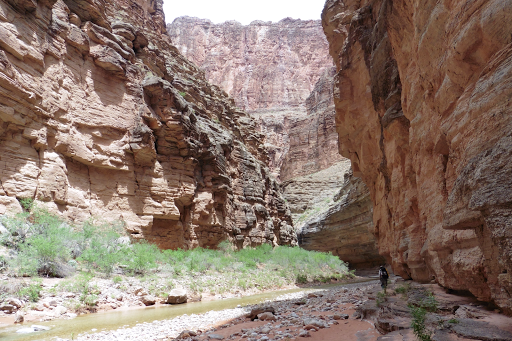 The traverse along the Colorado was what connected Deer Creek (which we came down yesterday) to Kanab Creek (which we’ll go up today). 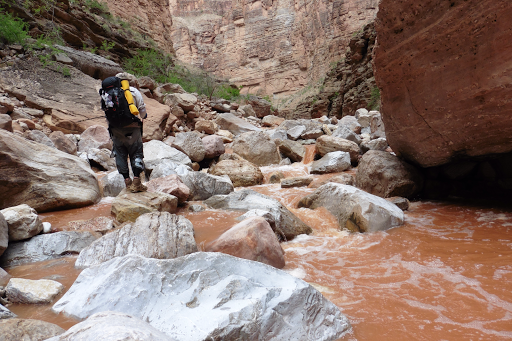 We knew Kanab Creek would be slow going, but it was worse than we had hoped. Maybe we are just spent, but it ended up being a continuation of more rocky hiking with the added fun of countlessly crossing the creek. Due to the recent rain, the creek seemed to be higher than usual and after going up a couple of miles, it became mud water that we couldn’t see through. I don’t think that is normally the case and it made crossings slower as we had less rocks to step on an had to feel with our sticks in the water wherever we stepped so we didn’t walk into an unexpected drop. 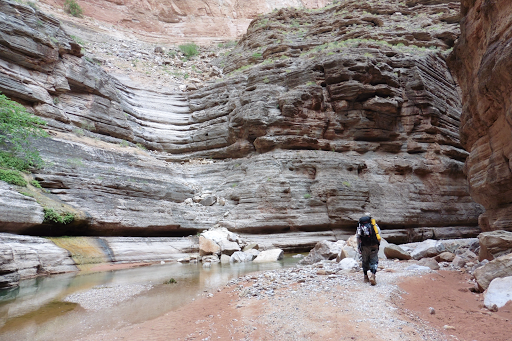 There were short bits on sand bars or rock shelves, but most of it was on medium-sized smooth river sandstone rocks…in shoes that were wet and had sand on them…no traction. It was pretty, but there wasn’t hardly a single moment that I wasn’t intensely focused on my foot and pole placement. There were a couple of sections with huge boulders to climb through and over. Very tiring and time consuming. 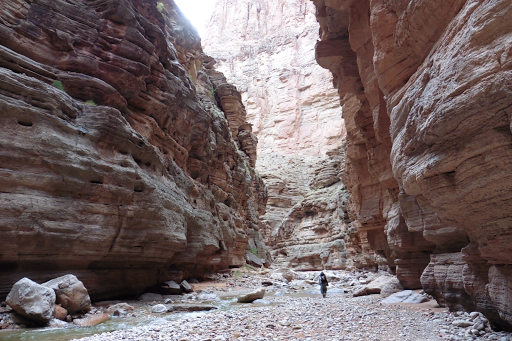 As we hiked up, we saw Jerry and Norm one last time and continued to be amazed that they were doing this hike…for the fourth time! 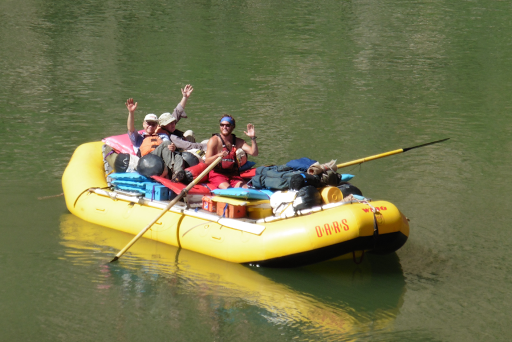 We also met some of the boat groups doing a day hike up a bit. One told us they had shuttled Katherine, just a day after us, from the same beach we had hitched to get from the south to north Bass Trail. That was confusing since her plan was a challenging route, that had her starting on the north side of the river with no need to hitch. They also told us she was also on the rocks this morning maybe an hour back from us. We should see her soon if that’s the case. We are interested to hear what happened since it seems that she had to bail on the other route, which happens to most who attempt it. We did take one side trip today to see Whispering Falls. I was told it was worth the side trip and a guide we asked today also recommended it. It was even waypoints on the track I have, so we thought we’d give it a try. At first, it seemed to look like a small spring and then we noticed we needed to do some climbing to get all the way back there. I went for it since I was already halfway here and was underwhelmed given the buildup to it. 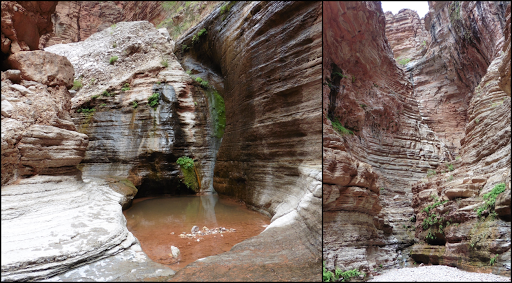 It was still nice to go and get some water that was clear since the Kanab was filled with mud. Here’s the mini fall and the actual one further back. 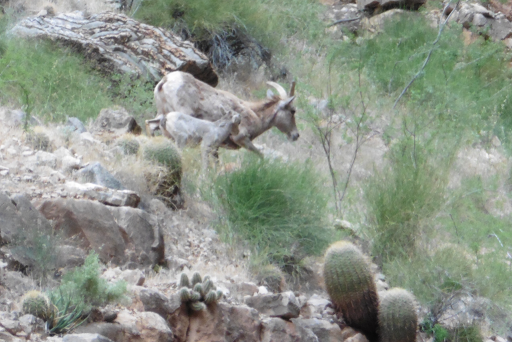 At one point, we heard rocks fall and looked far up to see a herd of bighorn sheep. Pretty cool! They moved fast and I got a shot of a daddy and little one. Yay! 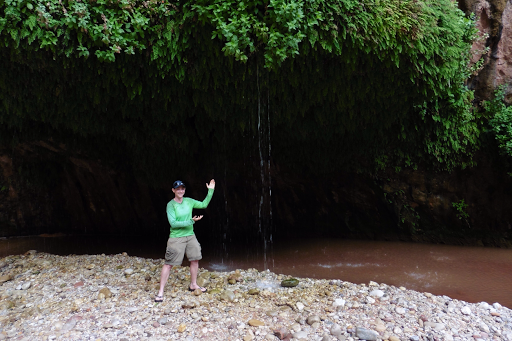 We are actually camped at a really cool spot called Showerbath Spring. It’s a lush green spring that drips down like rain. We are camped right in front of it and it’s one of my favorite spots all trail: Really unique and I love falling asleep to that sound. We are both spent after the last few days and the length of this leg. Or feet have been wet for three days straight and having a whole day on rocks are not helpful. The balls of my feet are quite swollen and the nerves hurt. Our shoes were full of small gravel bits most of the day from walking in the creek. Each step today required a ton of focus and we are both mentally and physically drained. I know I’ll sleep hard tonight!